Julian Przyboś, who emerged from the Kraków avant-garde, always strove for originality. He generated new lyrical situations, transgressed genre and typological conventions, sought to condense meanings, and constructed astonishing metaphors. In connection with this fact, the poetics of the moment is extremely useful for analyzing his work. It is particularly helpful in examining the specific juncture of what is literary with what lies beyond the text– with the author’s life experience and the books he has read. The need to generate a conceptual apparatus of the moment is determined above all by intertextual relationships, particularly in poems referencing the poetry of Słowacki. For Przyboś, a literary text is an element in reality, a record of other people’s observations, and an act of creation, because looking brings new worlds into existence. Poetic vision thus takes shape in the constant abrasion of the relationships that form the triangle of poet-text-world, or as Edward Balcerzan has proposed, “Self-World-Poetry” (where “world” can be replaced by “language,” understood as a synecdoche of the World or a metaphor for reality or “poetry” understood as a group of realized conventions, the language of poetic tradition). This modified juxtaposition of poet, tradition, and work offers an illustration of how cultural inheritance functions in the Przyboś’s creative consciousness. Intertextual relations are its expression. A particular model of intertextuality (referred to with some simplification by Barbara Łazińska as geographical or landscape intertexts) appears in poems that simultaneously document the reception of a given literary work and the perception of the fragment of reality dealt with in that work. The way this functions can be traced most easily in Przyboś’s dialogue with Romanticism, especially with the legacy of Juliusz Słowacki. Przyboś came to appreciate Słowacki’s creationism relatively late, when he himself had already developed some essentially similar creative strategies. Stanisław Balbus pointed out that Przyboś perceived these similarities “when his own theory of image creation was already fairly precisely defined and mature.” The author of Tęczy na burzy (Rainbows on the Storm) thus appears more to be an inquisitive commentator on literary tradition – as Edward Balcerzan has called him – than an heir to Słowacki, and freely engages in dialogue with the old master. We should also remember that the avant-garde poet’s creationism differs from seemingly similar nineteenth-century positions. Romantic creationism raises up the world “as if from its foundations, anew, with only a distant likeness to experience,” where in Przyboś’s poetry the lyrical persona brings the world into existence through his perception of it. He creates, looking, but does not extract unreal forms from the nooks and crannies of his imagination. He is more a manager, in Zdzisław Łapiński’s words, of an aggregate of perceptions than of a world of objects. In Przyboś’s work, there are three main areas of intertextual references to the poetry of Słowacki that we can basically distinguish. The first area is centered on Słowacki’s “Hymn,” with whose supposedly pessimistic oratory Przyboś had already begun to polemicize in the late 1930s (in “Z rozłamu dwu mórz” [The Division of Two Seas] from the book Równanie serca [Equalization of the Heart], 1938) and to which he returned again in his 1961 book Próba całości (An Attempt at Wholeness) in the poems “Miejsce dwu mórz” (The Place of Two Seas) and “Przypisek do ‘Hymnu’” [Footnote to “Hymn”]). The second stage began under the influence of events in the centennial year (celebrations in 1949 of the hundredth anniversary of Słowacki’s death) and, in connection with those, his re-reading of Słowacki’s epic poem W Szwajcarii (In Switzerland) and other works by the bard; this stage was marked by the books Rzut pionowy (Vertical Throw, 1952) and – particularly – Najmniej słów (The Least Words, 1955). Two ways of relating to prophetic poetry, to some extent interconnected with each other, can be delineated in these books: direct references to W Szwajcarii (manifesting the features of intertextuality in Genette’s narrow definition of the term) and less straightforward connections with the earlier poet’s manner of constructing and presenting space, in which it is sometimes difficult to establish a connection to a specific poetic text of Słowacki’s, since the reference is rather to the overall poetics of his works, his way of representing and building metaphors. In this vision, the azure eye color of the beloved surrounds her figure entirely, throws its gleam on her like a projector, the poet dresses her in the azure of her eyes. And from this vision of the azure-eyed woman, he illuminated all of Switzerland in azure. Clear references to the epic W Szwajcarii and other poems by Słowacki relating to his time spent in the Alps can be found in Przyboś’s poems “Tęcza na burzy” (Rainbow on the Storm, from the book Rzut pionowy, 1952), “Giessbach,” and “Tęcza pozioma” (Horizontal Rainbow, from the book Najmniej słów, 1955). These poems not only refer to those works via their creative construction of space, but also reference specific hypotexts, unambiguously indicated through epigraphs, quotations and invocations of titles. “Tęcza na burzy” is the poem most frequently cited in discussions of Przyboś’s connection to Słowacki; it is presented with a motto taken from the Romantic epic W Szwajcarii. In that poem, verbs conjugated in the present tense of the first-person singular– “powtarzam, odczarowuję, odwracam, jadę, ścigam, maluję” (I repeat, I disenchant, I turn, I pursue, I paint) – render the text dynamic, naming the activities undertaken by the lyrical persona in relation to both the Swiss landscape and Słowacki’s poetry. The repetitive nature of these actions signalized by using imperfective verbs (in the Polish) relates both to re-reading W Szwajcarii, familiar to Przyboś from his school days and university years, and the newly discovered process of a journey to the Aare valley, following in the footsteps of the Romantic poet both geographically and poetically, attempting to record in verse the impressions of the mountain landscape. Przyboś’s declaration “I repeat them, in order to catch up…” does not signify an attempt to inscribe himself within the bard’s poetics, adopt his stylistic manner or imitate his way of describing landscapes and portraying space. The pursuit of Słowacki is not a synonym for rivalry with him, but rather an attempt to fight the passage of time, to reconstruct Słowacki’s feelings, made possible by the juxtaposition of the Romantic’s poetic vision with the real landscape that figured as that vision’s object. The twentieth-century poet analyzes, with intense interest, Słowacki’s way of looking, as if testing the effects of optical stimuli, the visual reception of landscape, that Romantic approach to seeing the world and translating impressions into the language of poetry. “Reading, I paint,” the poet declares. Real scenery whose optics he has actually experienced have inscribed themselves in his consciousness so powerfully that when he reads a Romantic epic, memories of his own impressions and feelings appear in his imagination simultaneously with visions suggested by Słowacki. Przyboś, in searching for his own vision of Switzerland, had to enter into a dialogue with the image of Switzerland sketched out by Słowacki. He was not looking for an independent, objective, realistic image of Switzerland – he had no desire to find it in Słowacki, nor did he want to create it himself. The poetic world interested him much more than the world outside poetry. He looked at Switzerland, as reflected in the poetry of Słowacki, and compared it with what was reflected in his own eyes. The subjective activity of seeing is the key to Przyboś’s creationism, not only in the poems inspired by the poetry of Słowacki. Bringing things into existence through looking, as Łapiński writes – endows the persona with lyrical competency as an “active looker,” situated in a concrete place and time, perceived through his perspective only. The poet’s gaze – like the painter’s – takes shape based on direct visual experience and reading experience. Przyboś must nevertheless reconstruct Słowacki’s way of seeing and look at Switzerland through his eyes, in order to then perceive new things in the picturesque landscape, not previously observed by anyone. In Przyboś’s poem, a phraseology is activated that unmistakably reveals the eye as a particular kind of matrix in which a series of images are recorded as effects of individual looking. “My eyes… drank in the colors of lakes,” declares the lyrical subject, evoking the impression that the eye is a kind of viewing-box into which a ray of light falls and is recorded for all time. The viewer’s particular visual experiences and general consciousness have a decisive influence on the way he takes in and registers successive encounters. This kind of conviction is directly linked to Strzemiński’s theory of seeing; in his thought, the reception of visual stimuli is crucially dependent on the impulses directly preceding them. 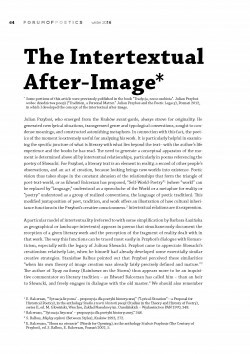 The modulation of such connections between texts, in which two ways of seeing the same extratextual reality are superimposed on each other, can be called an intertextual after-image. In this singular construction, hypertext and hypotext are not only linked through the coordinates of intertextuality, but relate to perception of the same (or a similar) fragment of reality, moored in autobiographical experience; furthermore, the manner of perceiving and presenting realia in the hypotext conditions the vision of the hypertext, influencing the subjective activity of seeing and superimposing itself on the created image. 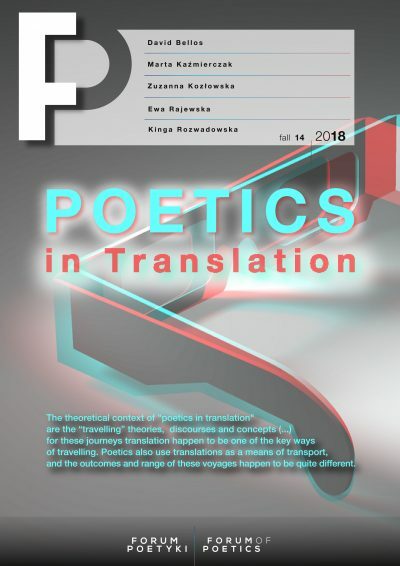 After-images in Przyboś’s poetry are accompanied by after-experiences connected to the other senses (echoes, aromatic associations, after-touch feelings) as well as – in this case and others – delayed reactions elicited by reading poetry. If a literary work has suggestively presented a landscape, the impressions it has elicited function similarly to visual stimuli and, like them, can generate after-images. The uncontrolled reaction of the retina can be repeated in the central nervous system even if the eye has not been directly stimulated. The consciousness of a sensitive receiver of poetry thus reacts not only to sensory stimuli, but also on long-elapsed impulses received by another and recorded in the literary work. For Przyboś, the reader of Słowacki, the text acts on the reader similarly to reality and can elicit a particular impression of an after-image if it affects the reception of a different text or the perception of the surrounding world. The analogy between the stimuli elicited by reality and by literature was considered by, among others, Mikhail Bakhtin, who – as Julia Kristeva writes – “situates the text within history and society, which are then seen as texts read by the writer, and into which he inserts himself by rewriting them.” Przyboś – unlike Bakhtin – perceives the literary text as an element of reality. A work of literature can sometimes be received in an almost sensory fashion, like light, warmth, taste or smell, and thereby exerts influence on the reception of successive texts read thereafter. The category of the intertextual after-image seems useful not only for the analysis of Przyboś’s poems. It can be a helpful tool in the study of many literary texts that follow the principles of mimesis, but simultaneously testify to the influence of culture in its various forms on our way of seeing the world. Werther, in Goethe’s novella, changes his attitude and begins to perceive the reality around him (particularly nature) differently than he had before, not only because of changes in his relationship with Lotte, but also under the influence of his reading. When he reads classical works, he sees harmony and order in his environment, but when he picks up the Poems of Ossian, the nature around him becomes hostile and unfriendly. The particular mechanisms of the Romantic hero’s construction also take place at the higher levels of a literary work’s structure, in which the model of mimesis is frequently determined by the author’s previous reading. The author’s reading experiences are transferred to lower (intratextual) levels of transmission and superimpose themselves on the realistic description. The achievements of Polish literature in the nineteenth century were in part shaped by the way Lithuania and the eastern borderlands were perceived, their particular scenery and wild, untamed natural features. Echoes of those texts (such as Pan Tadeusz or Nad Niemnem [Over the Niemen]) can be heard in many works by Miłosz (for instance Dolina Issy [The Valley of Issa]) or Konwicki (for example in Rojsty). The gaze of a writer, though he be the most acute observer imaginable, is thus not free from the gazes of others in his experience, earlier recorded in a culture. A particular model of intertextuality can be observed in Julian Przyboś’s poetry; it occurs in poems bearing witness simultaenously to the reception of a literary work and the perception of a fragment of reality dealt with in that work. Przyboś feels that the viewer’s individual history of visual experiences and overall consciousness has a decisive influence on the way he or she assimilates and registers subsequent experiences. This conviction is directly linked to Strzemiński’s theory of seeing; in his view, the reception of visual stimuli is crucially dependent on the impulses directly preceding it, so that the way we perceive what we are looking at now is determined by the image of what have looked at earlier. A particular kind of dependence between Przyboś’s poetry and the poems of Słowacki can be called an intertextual after-image. This term can have further applications in dealing with intertextual dependence in other texts. Some portions of this article were previously published in the book “Tradycja, rzecz osobista”. Julian Przyboś wobec dziedzictwa poezji (“Tradition, a Personal Matter.” Julian Przyboś and the Poetic Legacy), Poznań 2012, in which I developed the concept of the intertextual after-image. E. Balcerzan, “‘Sytuacja liryczna’ – propozycja dla poetyki historycznej” (“Lyrical Situation”—a Proposal for Historical Poetics), in the anthology Studia z teorii i historii poezji (Studies in the Theory and History of Poetry), series II, ed. M. Głowiński, Wrocław, Zakład Narodowy im. Ossolińskich – Wydawnictwo PAN 1970, 348. Balcerzan, “‘Sytuacja liryczna’ – propozycja dla poetyki historycznej,” 348. S. Balbus, Między stylami (Between Styles), Kraków 1993, 272. E. Balcerzan, “Słowa na otwarcie” (Words for Opening), in the anthology Stulecie Przybosia (The Century of Przyboś), ed. S. Balbus, E. Balcerzan, Poznań 2002, 5. See Z. Łapiński, “‘Świat cały – jakże go zmieścić w źrenicy’. (O kategoriach percepcyjnych w poezji Juliana Przybosia)” (“The Entire World—How to Fit it into the Pupils of One’s Eyes.” [On Categories of Perception in the Poetry of Julian Przyboś]), in the anthology Studia z teorii i historii poezji, series II, ed. M. Głowiński, Wrocław, Zakład Narodowy im. Ossolińskich – Wydawnictwo PAN 1970, 307-308. A. Litwornia discusses references to Słowacki’s poetry in Przyboś’s Italian poems included in the book Najmniej słów in “Konteksty włoskich wierszy Juliana Przybosia” (Contexts of Julian Przyboś’s Italian Poems), in: Stulecie…, 117,122,128, 131. Gérard Genette, Palimpsests: Literature in the Second Degree, trans. Claude Doubinsky. University of Nebraska Press, 1997. J. Przyboś, W błękitu (In the Azure)…, 293. J. Przyboś, W błękitu…, 293. J. Kwiatkowski, Świat poetycki Juliana Przybosia (The Poetic World of Julian Przyboś), Warszawa 1972, 148. Pisze o tym E. Balcerzan, Poezja polska w latach 1939-1965. Część I. Strategie liryczne (Polish Poetry in the Years 1939-1965. Part I. Lyrical Strategies), Warszawa 1984, 232. S. Balbus, Między stylami, 303. Z. Łapiński, “‘Świat cały – jakże go zmieścić w źrenicy,’” 279-280. W. Strzemiński, Teoria widzenia. Kraków 1958, s. 51. Julia Kristeva, “World, Dialogue, Novel,” in Kristeva, The Kristeva Reader, ed. Toril Moi, New York: Columbia University Press, 1986, 36.